We were hired to design 2- and 3-bedroom apartments on several floors in the newly constructed, glass-enclosed portion of this signature Archi-tectonics building. After considering several options presented to him, the client chose to convert three units, on floors 4, 6, and 7, into a total of five apartments. Floors 4 and 6 were large enough to provide two 2-bedroom apartments in each. The 7th floor unit was designed as one large 3-bedroom apartment that maintained the loft-like, open feel. In order to maintain the maximum visibility of the folded glass facade, we proposed steel-framed glass fin walls as the mediators between the curtain-wall and the opaque partitions. The design concept had to be clean and simple for marketability, since the fit-out was speculative. We sought quality finishes and products, considering the high-caliber clientele. 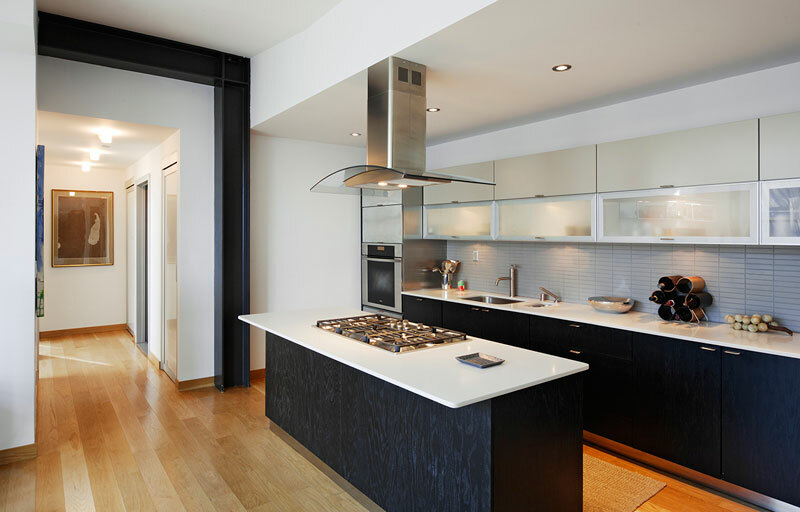 For the 4th and 6th floor kitchens, we selected dark wenge cabinets to contrast the white oak flooring. For the 7th floor, we preferred light sycamore cabinets to set a different tone from the other apartments. Warm, coffee-colored glass tiles and limestone were chosen for the master bathrooms, while cool, refreshing blues and whites were chosen for the guest bathrooms. We chose sculptural, geometric faucets, and high-quality modern doors and hardware to provide tactility and focal interest within the clean spaces.